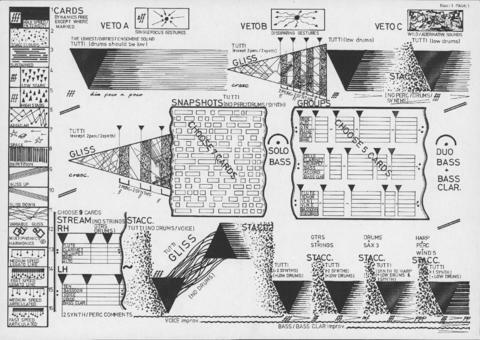 Item is a complete conductor's score for part 1 of Nasca Lines, in graphic notation. The conductor uses the score in conjunction with flashcards, including VETO A, B, and C. Other flashcards used in the performance of this part of the composition are lost, but the images of each flashcard and their meanings are captured on the score for part 1. Each image serves as the basis for improvisation.